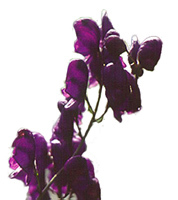 Aconite - a great remedy for sudden acute fevers following getting chilled. Here you may download information about the course to print or browse at your leisure. I think our prospectus is a rather dull, dry document. It is very difficult to put on paper what we actually do and how we do it. It can all appear terribly academic and whilst you do need to study the remedies etc, the best way to discover what the course is about, is to visit us. So don't let the Prospectus put you off - come and see us. The Prospectus covers most of the information in the pages of this site and some that is not here. It is 480 Kb so if you have a slow connection allow a little time for this to download. The Prospectus is updated from time to time to reflect developments in the course. It is broadly the same as last years. By clicking the links on this page you may download the Prospectus file but you may need Adobe Reader to open it as it is a pdf files. Most computers already have Adobe Reader on them but in case yours does not this site will allow you to download it. Click here to download the Prospectus as a pdf file. Click the picture to go to the Adobe site. Click the download link and find Adobe Reader button to install. It is free and is safe. You are now ready to open the Prospectus. If you are interested in the course have a look at the 'Joining' page - it tells you how to make enquiries about the course as well as how to apply.